“The two local girls from Bella Muse” — as Ogden artists Shanna Kunz and Elizabeth Robbins describe themselves — are taking their art uptown, to the Eccles Community Art Center’s main gallery, for the month of December. A reception for the artists is Friday, December 4. Kunz, who grew up in Ogden, sees this exhibit as a way of giving back to an arts organization that has supported her from the very beginning of her career. 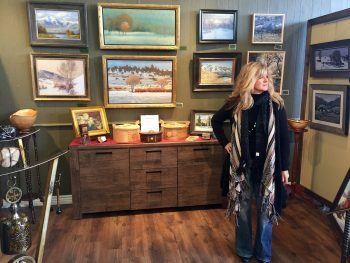 “My first exhibit was in the Eccles Carriage House Gallery,” she says. But the “giving” goes both ways. 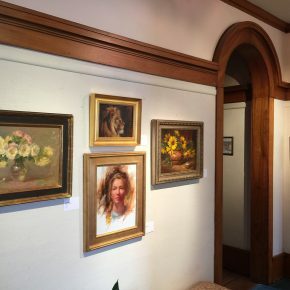 Exhibiting in the old Eccles mansion, especially during the festive holiday season, is an opportunity to draw attention to both artists’ downtown studio and gallery, Bella Muse, on the corner of 25th St. and Wall Ave., across from the train station. For this exhibit Kunz and Robbins took most of their work from their own gallery, brought paintings back from some out-of-state galleries, and added some new work to hang at Eccles; about 50 paintings in all. 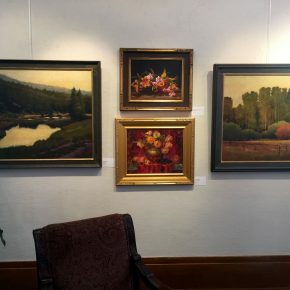 Robbins’ classical romantic floral paintings and Kunz’s contemporary landscapes seem to complement the 1893 mansion once owned by the David Eccles family. In this traditional, historic, home setting, the paintings seem comfortable, right at home. Kunz claims she doesn’t “have the patience for realism,” and prefers to think of her work as abstracted because of the design choices she makes about simplifying shapes and using a subtle, moody color palette. 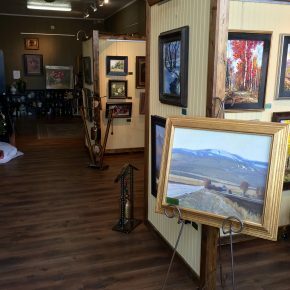 Yet, to the untrained eye, her work is “real.” It takes the viewer to a familiar place — a tree-lined, snow-covered road; a stream reflecting trees and marshes; a stand of aspens in the foothills. “I’m in love with the landscape because I spent so much time as a child watching my father fly fish,” she says. She works on several paintings at a time, patiently adding layer upon layer of glazes to achieve the mood she wants. 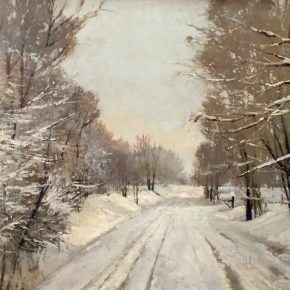 Robbins, on the other hand, paints “alla prima,” which means that she paints quickly and tries to finish a painting in a day, working with wet paint on top of wet paint. Her favorite subject, flowers, is inspired by her grandmothers, who taught her to love flowers and to grow them. “About 90 percent of my flower paintings are of flowers from my own garden,” says Robbins, who has about 70 rose bushes and grows countless other kinds of flowers. She brings the cut flowers into her studio, artfully arranges them with vases and other still-life objects, and paints them from life. Sometimes she photographs the arrangements so that she can continue to paint her own flowers through the winter. 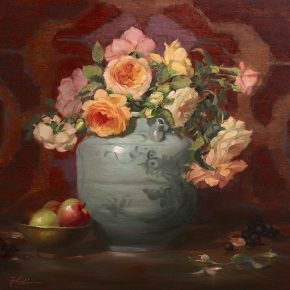 Robbins calls her style “classical romanticism.” It has the Rembrandt-like focus on light and shadow, often with a dark background, which makes the lighting on the flowers all the more dramatic. Her flowers aren’t stiffly posed, but have a more casual attitude of abundance and love. One thing the two artists share is an emotional connection to their subjects. 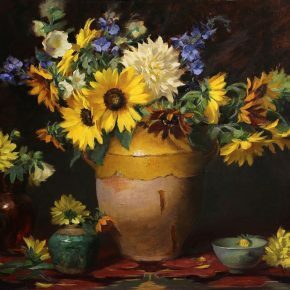 Kunz calls this “authentic.” They paint what they love and believe the heart and soul that goes into their paintings will connect with their viewers. They’re not painting “what sells,” but they’ve learned that their paintings will sell to the viewer who recognizes and shares their emotional investment in their work. Kunz and Robbins are longtime friends, but their relationship as studio mates and business partners is less than two years old. Robbins was a Salt Lake girl. After her husband passed away, Kunz suggested she move to Ogden. Robbins scoffed at the idea until Kunz called one day to say her neighbor had moved and the house was on the market. Somewhat reluctantly Robbins went to see it and discovered it was perfect. It had plenty of space to grow the flowers she needed for her paintings. The life of a painter can be lonely, so the two women enjoyed going back and forth to each other’s home studios to share what they were working on and take breaks. One day while taking a break to walk their dogs, they began to fantasize about someday having a studio together. “Let’s pretend,” started Kunz, and within two weeks a vision, scribbled on a napkin, led them to sign a lease on the perfect building on Historic 25th Street. Bella Muse quickly evolved from studio space to studio plus art gallery. It was just too beautiful to keep all to themselves. The two artists, while happiest when they are painting, have another important goal. As Kunz explains, they want to educate Utahns about fine art and the caliber of artists right in their own backyard. To that end, the partners began inviting other local artists to exhibit at Bella Muse. 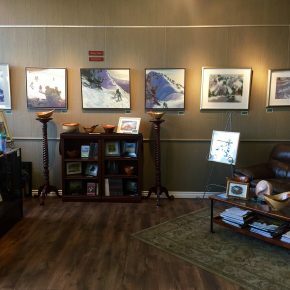 In December, while much of their own work is at the Eccles, they will feature the paintings of Nancy Ness and the pottery of Salt Lake artist Ben Behunin. 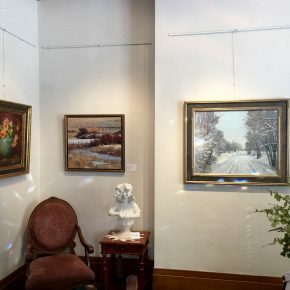 Each month they feature different artists and hold a reception during Gallery Strolls on the first Fridays of the month. Robbins points out that it’s hard to have your value recognized in your own backyard. There’s a feeling that a painting purchased in Jackson, Santa Fe, or Sun Valley must be better. But, says Robbins, there’s a good chance the painting the collector falls in love with in one of those art destinations came from a Utah artist. Robbins calls Utah one of the biggest art exporters in the country. 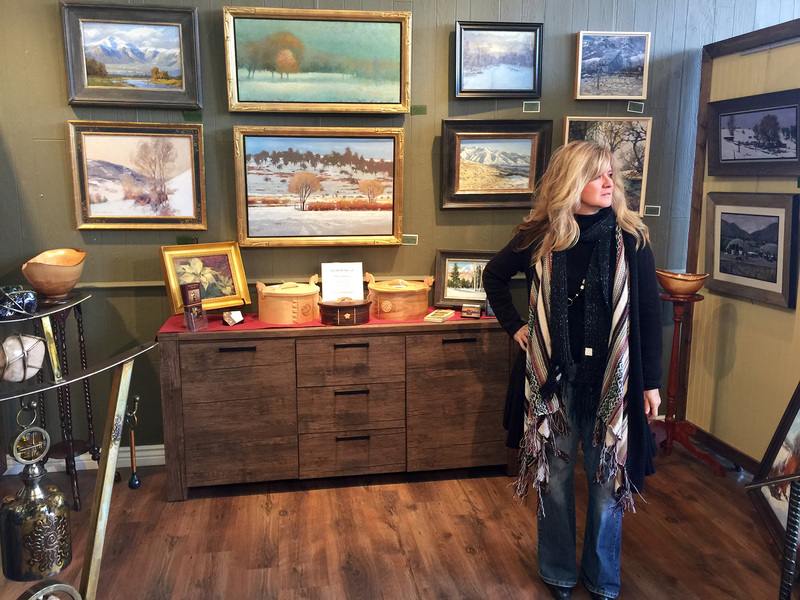 “More gallery artists making representational art are from Utah than from anywhere else,” she states. Between their own Bella Muse gallery and this month’s exhibit at the Eccles, they hope their message will reach a broader audience of art lovers and collectors. 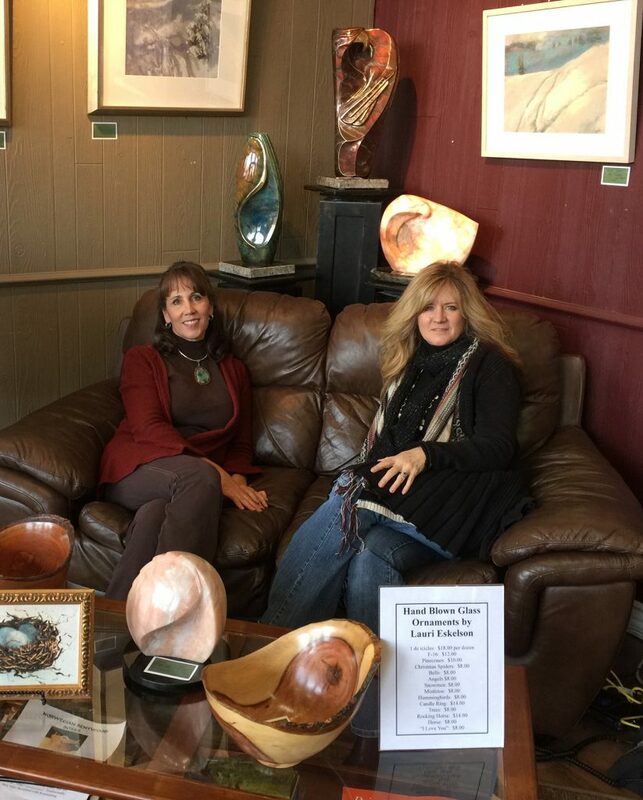 Shanna Kunz and Elizabeth Robbins, Eccles Community Art Center, Ogden, through Dec. 31. Opening reception Friday, Dec. 4, from 5 to 8 pm. Bella Muse is located at 101 Historic 25th St. in Ogden.